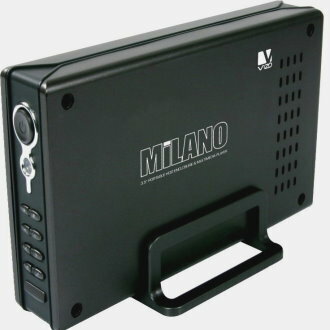 VIZO MIP-100, 3.5” PORTABLE HDD ENCLOSURE & MULTIMEDIA PLAYER, is no longer just an external storage, but also a music/movie theater for you. MIP-100 features the high performance Sigma Designs Chipset which supports the present artery multimedia format and supports hard disks with up to 500GB capacity, which is enough to save 500 films, exceed 150,000 MP3 music, or 1,000,000 pieces high distinctive digital photos. With all-in-one design and easy-to-use wizard interface, you can enjoy movie, photo and music with a touch the remote control, moreover, back up and transfer your data storage for your needs.